The printable jokes for kids that I’ve been creating for the past few months have been a huge hit around here! Little M even asked me to stop sending the knock, knock jokes for a few days because the other kids were begging to hear them. (I guess she got tired of the extra attention… funny.) How has your family liked them? Make sure to check out the printable winter Sudoku for kids as well! 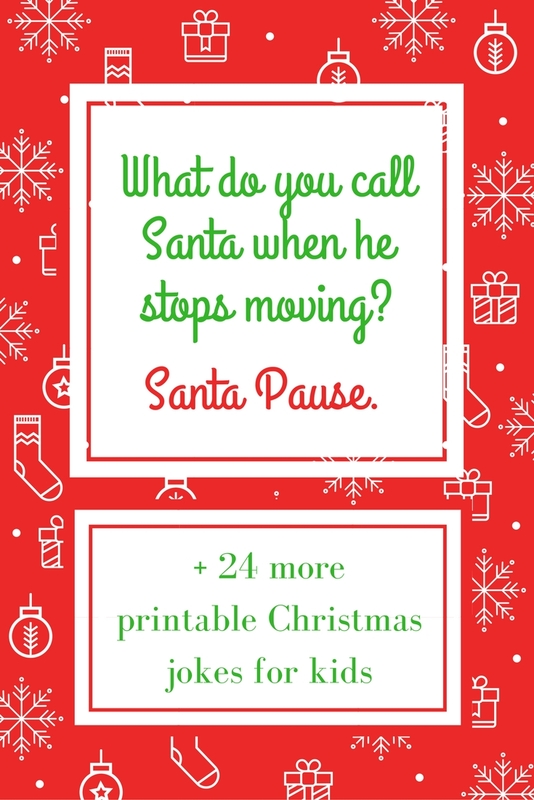 There are a few fun ways to use these printable Christmas Jokes. Choose one of these or come up with your own way to use them. Share your idea in the comments! Have the Elf on the Shelf bring a new joke every day. Make an advent calendar with jokes. Click here to print your Christmas Jokes. What’s red and white, red and white, red and white? — Santa Claus rolling down the hill. Where do snowmen keep their money? — In a snow bank. What do you get when you cross a snowman with a vampire? — Frostbite. What do you call Santa when he stops moving? — Santa Pause. What kind of bug hates Christmas? — A humbug. What goes “oh, oh, oh”? — Santa walking backwards. Why is it so cold at Christmas? — Because it’s Decembrrrrr. This year even the toys are stressed out! — Yeah, they came already wound up. What did the gingerbread man put on his bed? — A cookie sheet. Knock. Knock. Who’s there? Hanna.Hanna who? Hanna partridge in a pear tree. Why did the gingerbread man go to the doctor? — Because he was feeling crummy. Where would you find chili beans? — At the North Pole. What do you call a snowman party? — A Snowball. Why does Santa have 3 gardens? — So he can hoe-hoe-hoe. Why did the elves ask the turkey to join the band? — Because he had the drum sticks. What’s Santa’s favorite sandwich? — Peanut butter and jolly. Who lives at the North Pole, makes toys and rides around in a pumpkin? — Cinder-“elf”-a. What do you get when you cross a bell with a skunk? — Jingle smells. I also found this cute riddle and included it in the printable. What kind of candle burns longer, a red candle or a green candle? — Neither, candles always burn shorter! Do you have a Christmas joke for kids to add? Share it in the comment section! These are super cute, as are the knock knock ones! I teach Art workshops and I almost always read the kids a story too so I can weave these in as comedy relief. I’m so happy to find these! For the last 2 months, I’ve been sending little riddles in my 2nd grader’s lunch box. She is the snack time entertainment so she’ll be glad to get some Christmas themed riddles. Thanks for sharing them! What do you call Santa when he shaves his beard?? We are doing a count down to Christmas with red and green popcycle sticks. After seeing this I wrote a joke on each one so everyday my daughter takes out a popcylce stick and reads a joke. She loves it. How fun Nikki! Thanks for the idea. What do you call a black, burnt gingerbread? A NINJA bread! I like when it says Decemberrrr????? Thanks for the jokes! I’m using these with a tear off snowman Christmas countdown for my kids. A joke of the day will help us remember to tear off a strip. I think they are going to love it! They are very helpful. I teach Spanish in middle school and I try to tell some jokes in Spanish–at least some words. Students look forward to this! I am preparing an activity with jokes for 6th graders, and I am using some of the jokes here. Thank you. One of my students´ favorites: “¿Qué dice la leche al azúcar?”– Te veo en el café. Why do elf go to school? I like these jokes to. But when I told them to my class they did not understand. Add a little HA HA to your HO HO HO this year with these 25 printable Christmas jokes.